X-Rays can usually show a Vertebral Compression Fracture. The change in the shape of the broken Vertebra is usually easy to see. This image is a Color X-Ray of the low-back (lumbar spine) taken from the side of the spine. The front of the spine is to the left, the back to the right. The normal vertebrae are shown in yellow-orange. 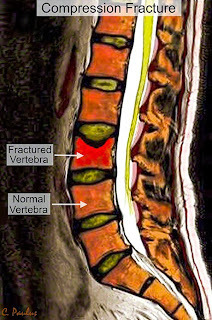 A Vertebra suffering from a Vertebral Compression Fracture (VCF) is shown in red. The top of the Vertebra is collapsed. MRI scans can show compression fractures. While MRI technology is not as good as a CT scan to show specific details of the vertebral bones, it is an excellent tool to see swelling inside a vertebrae from a VCF, and a potential compression of the spinal cord and spinal nerves. CT scans are excellent tools to see the bone anatomy of the spine. VCFs can be seen clearly. A burst fracture and its pieces can also be seen. 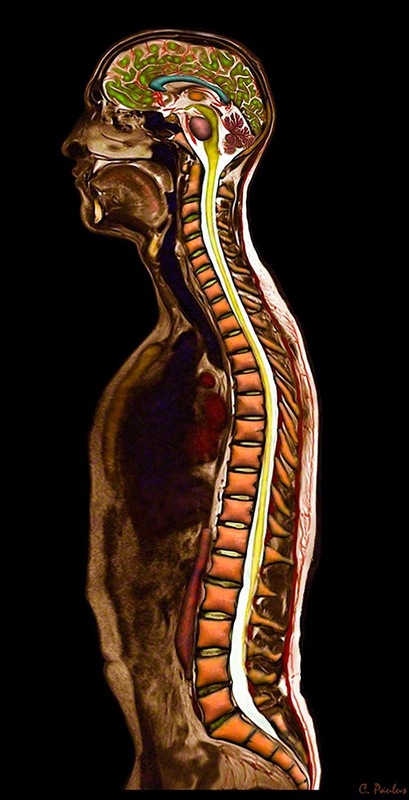 This can help doctors understand if the spinal cord could be compressed. 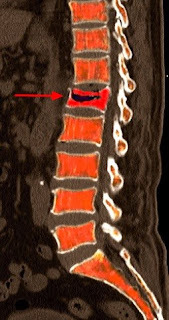 When combined with a myelogram (dye injection into the spinal fluid), the spinal canal and spinal cord can be seen as well. 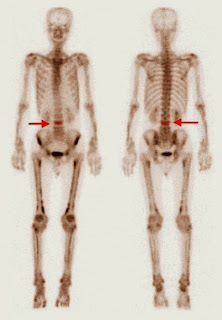 Nuclear bone scans show the activity in a VCF which is created by the body’s attempt to heal it. It can be very specific for a VCF and show where in the spine it is located. However it cannot show any details about the fracture or the other structures which could be affected by it. 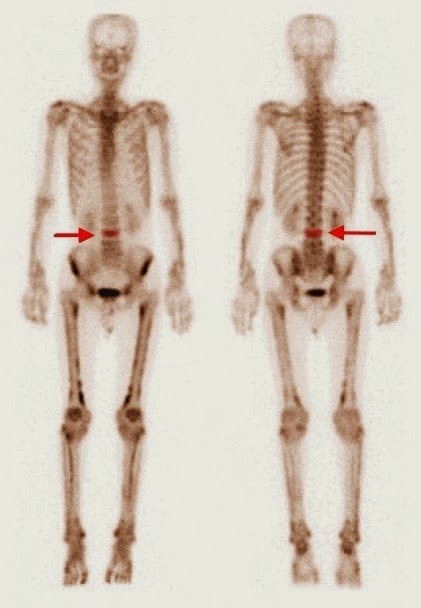 This image is a Nuclear Bone Scan of the whole body, taken from the front on the left and back on the right. An area if increased activity is seen in one of the vertebrae of the low-back (lumbar spine). This is often due to a severe compression fracture. Typically for new compression fractures it is recommended to limit bending, twisting, lifting and any other higher impact activity such as running. Alternative Health care options can often complement conventional medical care. Massage Therapy, Acupuncture, Meditation exercises and Herbal Remedies can all help with the pain from this condition. Massage Therapy has to be done in a very gentle fashion to avoid placing pressure on the fractured area of the spine. It may be more useful for an older, healed fracture. Proper nutrition and weight loss can have a positive impact on many spine conditions. Excess weight on the spine often contributes to the symptoms of pain and spasms (Spine and Obesity). Chiropractic care including manipulation and adjustments of the spine can help with the pain and spasms from this condition after the fracture is healed. Spine manipulation and adjustments are usually not recommended for a new fracture. Spine exercises can help with the muscle pain and tightness from this condition. Exercise also increases the amount of oxygen delivered to the spine which can help with healing. Pilates, Yoga and T’ai Chi can help maintain the spine’s flexibility. Only very gentle types of simple stretching exercises are recommended for new fractures. PT has many modalities to offer for this condition. They can range from gentle Manual Therapy and Exercises to gentle Traction and Ultrasound Treatments. PT can help mobilize patients who are suffering from the pain related to a VCF. Minimally invasive treatment options can help with the pain and instability of the vertebra from VCF’s. They inject bone cement into the fractured Vertebra. 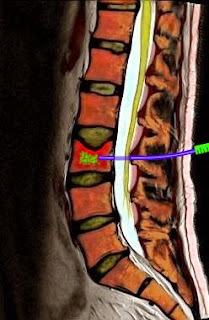 Vertebroplasty Procedure: This Color MRI Image shows Bone Cement (green) being injected into the broken Vertebra to provide pain relief and stability. 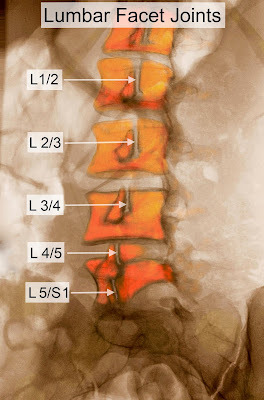 Kyphoplasty Procedure: This Color MRI shows the Lumbar Spine (low back) from the side. The front of the Spine is to the left. 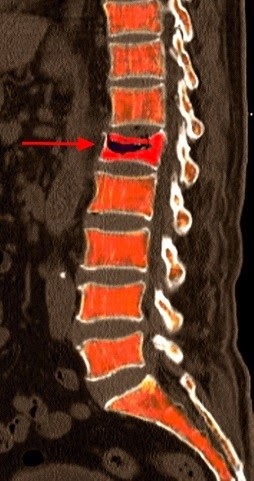 A Compression Fracture (broken Vertebra) is seen in red. A large Needle (blue) has been placed into the broken Vertebra. A powerful balloon (green) has been inflated within the broken Vertebra in hopes of raising it back up. After the balloon is removed, bone cement is the injected just like it is seen in the Vertebroplasty Image above. Surgical treatments for VCFs are usually only required for fractures which are creating pressure on the spinal cord or spinal nerves, or those resulting in a lack of stability of the spine. Typically, these types of fractures are the result of significant trauma or cancer. What is a Lumbar Compression Fracture? A Vertebral Compression Fracture (VCF) is a collapse of a vertebra in the spine. The body of the vertebra which is the front section of the vertebra, collapses. Since the collapse of the vertebra is in the front of the vertebra, the spine often begins to curve forward. This Image is a Color MRI scan of the low back. The front of the low back is to the left. The Vertebrae are shown in orange, separated by the Discs in green. 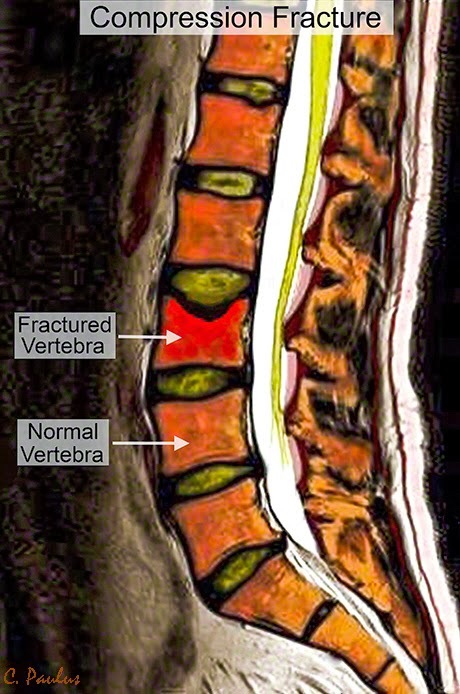 A Fractured Vertebra is shown in red. Notice how the top of the Vertebra has collapsed. Why do patients get a Compression Fracture? VCF’s are caused by too much pressure on the front of the vertebrae, or weakness of the vertebra. This can happen when the spine is bent forward (flexed) or too much weight is placed on the spine. This often causes the vertebral body to collapse in a wedge shape (smaller in front than back). Less common is a burst fracture, where the vertebrae breaks off into pieces, some of which could cause compression of the spinal cord or spinal nerves. While osteoporosis related VCF’s are the most common, they can also occur due to trauma or bone cancer. How common are Vertebral Compression Fractures? It is estimated that 700,000 VCF’s occur each year in the U.S.. Studies have shown that up to 15% of women and 5-9% of men will have a VCF in their life time. 40% of women over the age of 80 will have a VCF. After having a VCF, the risk of having another one is 20% in the first year in women after menopause. How long do Vertebral Compression Fractures take to heal? This depends on the reason for the fracture. Fractures related to trauma and osteoporosis tend to heal within 8 weeks. Fractures related to cancer may not heal completely. What are the common symptoms from a Vertebral Compression Fracture? c. Worsened pain with standing, sitting or walking, improved when lying down. 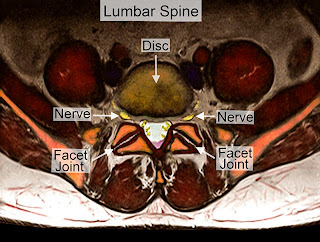 Medical Media Images has created an Interactive Image of an Artificial Disc Replacement of the Lumbar spine (low back). This Interactive Image allows the viewer to learn about Artificial Disc Replacements from a Color X-Ray. The Interactive Image above shows the Lumbar Spine (low back) from the front. The last two ribs can be seen at the top of the picture, the pelvis at the bottom. 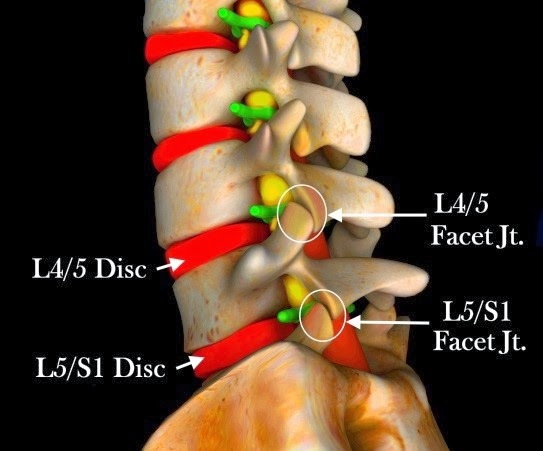 An Artificial Disc Replacement Device has been implanted at the 2nd lowest Disc (L4/5). The metal components are seen in blue. They are implanted into the Vertebrae above and below. The green component is the flexible plastic core which provides the movement. New Interactive Color Knee MRI created showing an ACL tear! Medical Media Images has created a new Interactive Image showing a Color Knee MRI which explains ACL tears. This Interactive Image allows the viewer to learn all about the Anatomy of the Knee and see a Normal and a Torn ACL Ligament. Just move your mouse cursor over the Image and start learning about the Knee Anatomy and ACl Tears. New Interactive Color MRI of the Knee Created, showing the ACL and PCL Ligaments! Medical Media Images has created a new Interactive Image featuring a Color Knee MRI. The interactive Images allow the viewer to learn about all the important Knee structures such as the ACL and PCL Ligaments. Just hover your mouse cursor over the Image and start learning about the Knee! How is Lumbar Facet Joint Degeneration diagnosed? Patients often complain of back pain following periods of rest once they resume an activity. Typically patients do not have a history of a specific low-back injury. Patients often feel the symptoms from facet pain come on slowly over time. 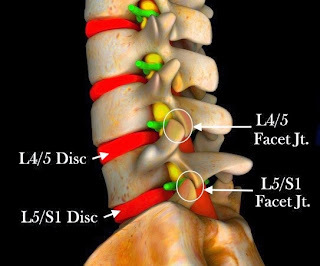 Spine specialists will try to divide symptoms of disc disease from facet disease while collecting the patient’s history of low-back pain. X-Rays can show facet disease if the joint is enlarged and the joint space narrowed. Some facet joints can appear relatively normal on an X-Ray and yet be the source of the patient’s spine pain. This image is an X-Ray of the low-back (lumbar spine) which shows the Facet Joints. Each joint is labeled. MRI technology is best used for softer structures rather than bone anatomy. However, MRI images can show facet joints quite well. It can also be useful to evaluate the disc at the same time to see if more than one possible disease process is present. Bone spurs and cysts of the facet joint can be seen. This image is an MRI scan of the low-back (lumbar spine) which shows the Spine in cross-section. The front of the Spine is to the top, the back at the bottom of the Image. 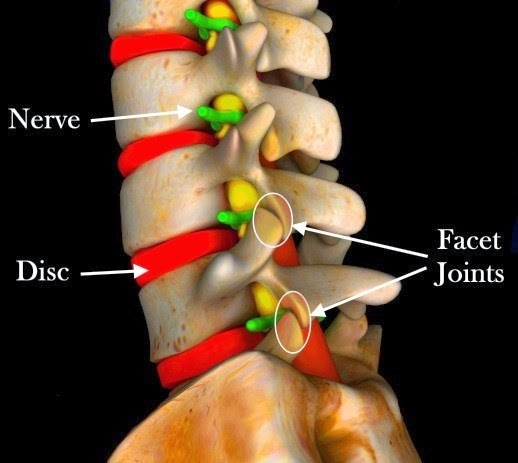 The Disc, Nerves and Facet Joint are annotated. This image is a CT scan of the low-back (lumbar spine) which shows the spine from the side. The front of the spine is to the left. The discs are shown in green located in the front of the spine. The facet joints are pointed out by the arrows. Bone scans are excellent at showing severe inflammation of the facet joints. However this study is only useful to evaluate bone. It cannot show the other structures of the spine such as discs and spinal nerves. This image is a MRI Scan showing the low-back (lumbar spine) in cross-section. The front of the Spine is to the top, the back at the bottom of the Image. 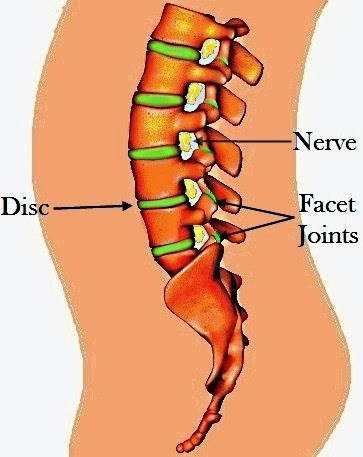 The Disc and Facet Joints are labeled. 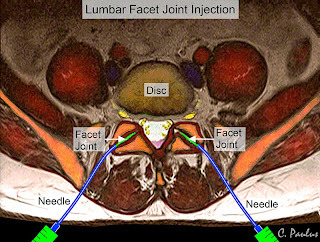 Two needles are shown placed into the Facet Joints. Medication (green) has been injected into the joints. For diagnostic reasons, sometimes the facet joint is anesthetized with a local anesthetic and the patient’s response to the injected evaluated. This can be done very soon after the injection while the anesthetic is still active. The injection is done with the help of an X-Ray machine to see the joints. A medial branch block is an injection done with local anesthetics to block the nerves traveling to the facet joint. The patient is then evaluated to see if the pain has improved or is eliminated. 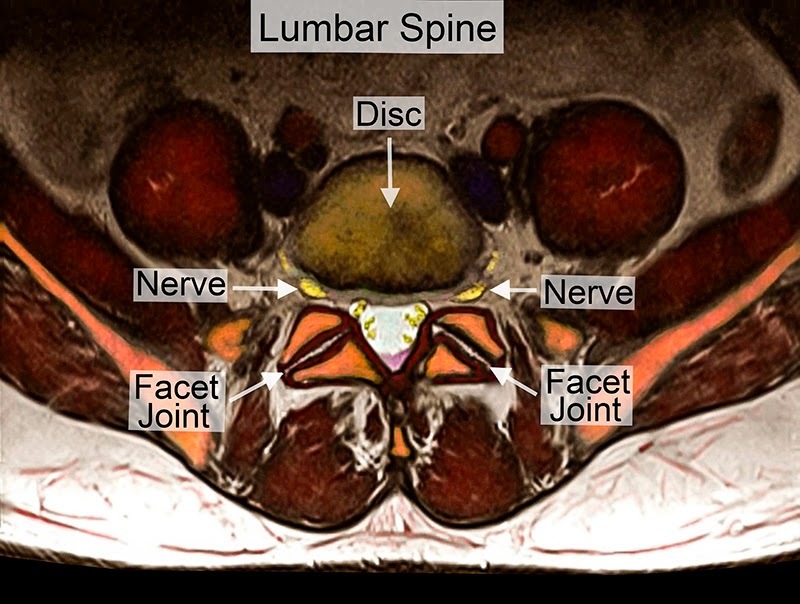 This image is a MRI Scan showing the low-back (lumbar spine) in cross-section. The front of the Spine is to the top, the back at the bottom of the Image. The Disc and Facet Joints are labeled. A Needle has been placed next to the Facet Nerve shown in yellow. Medication can be injected to block the function of this Nerve. In the next Patient Education Blog we will feature Treatments for Lumbar Facet Joint Degeneration! What are Lumbar (low back) Facet Joints? Our Facet Joints are the joints located on the back of our spine opposite the disc, which is located in the front of the spine between the bodies of the vertebrae. The facet joints are made up by bone pieces (articular processes) from the vertebrae next to each other. Each vertebra contributes one articular process to the joint. The facet joint itself has cartilage like many other joints in the body. Each joint is surrounded by a tough capsule which strengthens the joint. This illustration of the low-back (lumbar spine) shows the spine from the side. The spinal discs (blue) are located between the vertebrae in the front of the spine, whereas the facet joints (green) are located on the back of the spine. What is the Facet Joint's Function? The facet joints move like windshield wipers when looking at them from the side. Flexion (forward motion) and extension (backward motion) are the primary motion of the facet joints. They also prevent the spine from slipping sideways in the horizontal plane (shearing). This illustration shows the Facet Joints of the low-back (lumbar spine) from the side. The front of the spine is to the left. The discs are shown in red. The spinal nerves can be seen traveling from the inside of the spine outward through the nerve channels. The two lowest Facet Joints of the low-back are outlined by the circles. What causes Degeneration of the Lumbar (low back) Facet Joints? Facet joint degeneration is a common problem and is expected to some degree as our spine ages. A contributing factor to this is the thinning of the disc as we age. The loss of the height of the disc will place more weight onto the facet joints, which begin to show signs of stress. Ordinarily, the facet joints carry 20% of the body’s weight. However with loss if the disc’s height and function, up to 50% of the body’s weight may have to be carried by these joints. Over time, these joints will lose their cartilage and the joint space narrows. Eventually, the joins enlarge as the two bones which make up the joint (articular processes) begin to make contact. As these articular processes rub against each other, they form new bone, resulting in spurring and enlargement of the joint. In addition, facet joint cysts can form. Which Facet Joints are most commonly affected by Degeneration? 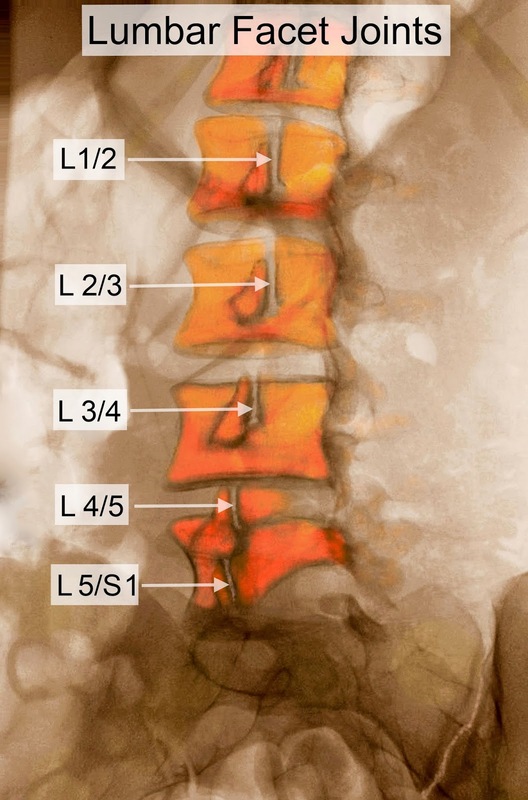 Facet joint degeneration is most commonly present in the same spinal segments most affected by degenerative disc disease, namely the L4/5 and L5/S1 levels in the low-back. This illustration shows the low-back (lumbar spine) from the side. The front of the spine is to the right, the back to the left. The discs are shown in red, located at the front of the spine. Two facet joints at the bottom of the spine are circled. What are the Common Symptoms of Lumbar (low-back) Facet Joint Degeneration? Patients with facet pain will often suffer from pain next to the middle of the spine (paraspinal). 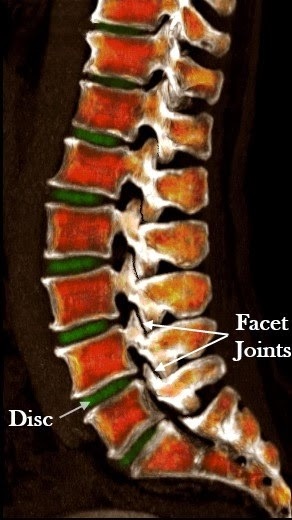 In our Next Blog we will discuss the Diagnosis and Treatment of Lumbar (low back) Facet Joint Degeneration! Medical Media Images is now offering a Video Slideshow featuring our Company and Products.